So… let’s start this off by saying that Pacific Rim was one of the best action movies I had watched when it debuted in 2013. It was everything I could have asked for in a movie that I didn’t ask for. Directed by the legendary Guillermo Del Toro and featuring a stellar cast that included Charlie Hunnam, Idris Elba, and Rinko Kikuchi; this movie hit like a freight train in epic proportions. And even better, it just happened. I wasn’t following movies as heavy back then so to me, it was just there one day. Giant robots? Check! Robots throwing hands with creatures and sometimes each other? Check! What more do I need? No movie had done something like this before in this fashion that wasn’t animated to my knowledge. Previous, I had to get this fix from animes such as Gundam, Code Geass, or Eureka Seven. And I remember all of the comparisons to those shows when the movie released. 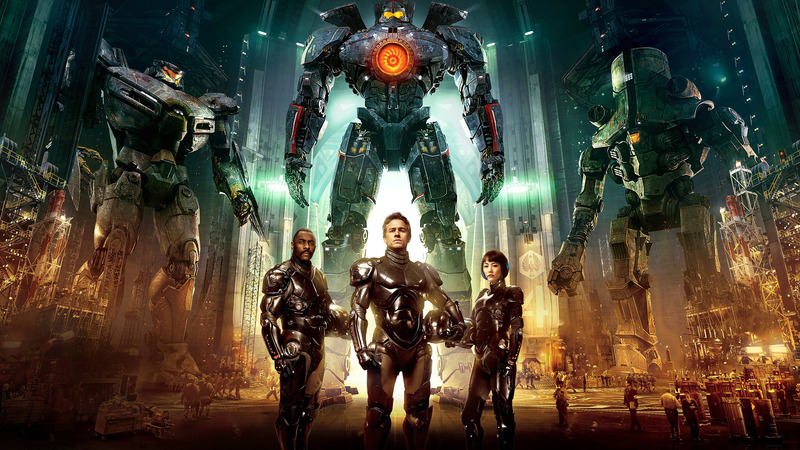 The film was set in a time where the earth was waging this large-scale war with these creature called Kaijus with giant humanoid human-operated mech suits called Jaegers. The jaegers were the greatest things since fidget spinners at the time. Their design and concept might not have been anything mind-blowing if you watched anime because how they operated the mammoth-like mechs actually similar to G Gundam just more mechanical than free-flowing but it was still really captivating to see it on screen. They also required two pilots which I thought was cool because the two pilots had to be in sync with each other. And then a trailer debut! As for the trailer, I really dig it. I like the motif to the original theme with the guitar rifts that flowed into the war chant of “Born Ready.” (I love trailers that sync the action to the rhythm of the trailer.) It got me pumped as got see the new version of what looks like Gipsy Danger and the other jaegers tear stuff up. Looks like we will be having Jaeger on Jaeger fighting in this one which is going to sick! (Did you see the dive into the slide slash by Gipsy!? Talk about fanning myself like a school girl!) What was that thing at the end!? A mega Kaiju!? Let me calm down. *Heavy Breathing* I hope that Steven S Deknight does this sequel justice. More known for being a producer on shows such as Daredevil, Spartacus, Smallville, and Angel and having directed at least one episode from each, this will be his first feature film. Guillermo del Toro will still be on board as a producer which is nice since this was his project, to begin with. I’ve watched this trailer at least about nine times now… What did you think of the trailer and are you excited about the movie? Let me know in the comments below! Bonus: Here is an 8-Bit Verison of the Pacific Rim Theme because it is awesome. Bonus x2: Here is a link to an interview the director if you want to learn a little bit more. There aren’t major spoilers here. It just discusses what the Jaegers and Kaijus have been doing since the events of the first movie. Next Post Two Car – Episode One: Racers, on your Mark!